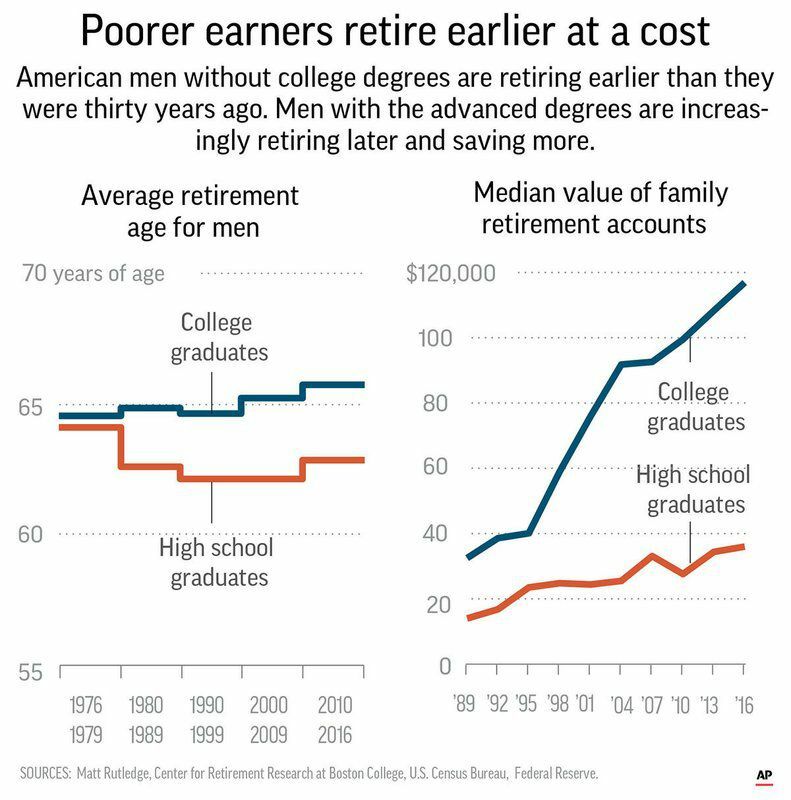 Two Americas: While the college educated are putting off retirement to enjoy fatter savings accounts, Americans without degrees are retiring early amid worsening health outcomes. Why it matters: The deck is significantly stacked in favor of those who can keep working past 65, the AP notes. "Consider someone who turns 66 this year and would get $1,000 monthly as their Social Security benefit. If that person had retired at 62, their monthly benefit would have been only $750. And for each year they delay getting benefits past 66, the size of that benefit will grow by 8 percent, until they reach age 70." The big picture: “If less-educated people were retiring early and comfortable in their retirement years, good for them, but we know they aren’t," economist Matt Rutledge tells the AP. "Among men aged 50 and over... 61 percent of workers without a college degree have to move heavy loads (or people) as a regular part of their job. That’s more than double the 23 percent rate of their college-graduate peers..."
"Lower-educated workers also are much more likely to have jobs that require them to stand all the time, do repetitive hand movements or be in tiring or painful positions." “'It’s much easier to work sitting down at a computer at 65 than in a warehouse,' said Craig Copeland, senior research associate with the Employee Benefit Research Institute." Two streaks in this long exposure photo show a SpaceX Falcon 9 rocket lifting off (left) and returning to Earth (right) from Vandenberg Air Force Base on Sunday. This was the company's first-ever dry-ground landing on the West Coast, Axios' Andrew Freedman reports, at a launch pad that had previously been used by the Air Force dating back to the 1960s. Go deeper. Hurricane Michael has rapidly intensified between Mexico's Yucatan Peninsula and Cuba, and may hit Florida's Big Bend region as a major Category 3 or 4 storm. Go deeper. President Trump said today that stop and frisk "works" and "was meant for problems like Chicago." Go deeper. Trump also said he has no plans to fire Deputy Attorney General Rod Rosenstein. Go deeper. Carbon dioxide emissions are on track to rise in 2018 for the second straight year following a plateau in 2014-2016, according to the International Energy Agency. Go deeper. Facebook is launching two in-home video chat hardware devices. The devices will help Facebook collect more data about how people use technology services, like voice assistants and long-form video, in their home. Go deeper. "Irate members posted to complain they were unable to log in to their profiles or merge their accounts, or discovered that their accounts were missing points or nights counting toward elite status." "Those who called Marriott found themselves on the phone for long stretches before they could speak to a representative..."
“The most important thing to me was the Platinum phone reservations line,” said Corey Loeffelholz... Being able to reach a live agent right away was a big advantage..."
"Mr. Loeffelholz said being routed to an automated phone tree had the potential to be a deal-breaker. "